These are the books, your companion guides that will take you from where you are now to where your soul is prompting you to be. These books make the profound practical within you and your life, they are 'how to' manuals and works of healing beauty. Each of the chapters are another step along your most lovefull way. Just reading the words creates cellular healing as these 'remembrances' connect with and release the power of your soul into your experience of your life. 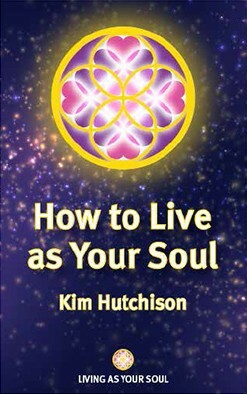 How To Live As Your Soul is the book that I wished I'd had when I first started to become aware that there was so much more to life, and to me, than I had been taught, told or shown. How To Live As Your Soul will take you step by step to becoming the power, love, purpose and healing reality of your existence, of your life. Our misunderstandings of what forgiveness, choice, emotions and Time really are, of what the 'spiritual laws' really are, prevent us from experiencing and being of our love, because they get in the way of our desire and ability to surrender our delusion that we can control the forces that shape our lives. These concepts propogate our belief that as long as we know what the rules are, then we can shape our destiny, that we can 'order in' what we experience in our lives, as if the cosmos was one big lunch menu! The oversimplification of what these concepts really are takes us away from their real meaning and value in our lives. The reality, the reality of the energy of your love, of your soul is at the same time more complex and more direct. Some of the cosmological physics aspects of the groundbreaking understandings in How To Live As Your Soul, which I have been teaching for the last 16 years, have been also mentioned in Stephen Hawking's The Grand Design, such as; M theory (the unification of the very large with the very small), what is reality and the illusion of free will. Knowing that the way in which you were brought up has impacted your behaviour and life experiences is, of course, very helpful and healing. However, that is rarely enough to release you from your long-held patterns of behaviour into a state of love, your Love Pattern of Reality. What is required to bring about this healing is the profound underStanding of why we have these experiences, why certain people come into our lives, why we have the parents we do and why our world, our cosmos operates as it does. When these underStandings have been profoundly received by our bodies and minds, then their profound healing can be received and thus we enter into the state of love that is living as our soul. How To Live As Your Soul shows clearly, concisely and lovingly how we can simply and profoundly understand why we are experiencing that which we are, the profound benefits to us of these experiences and how we can reap their rewards, their gifts of love, their gifts of healing, their gifts of our joy, their gifts of our soul. How To Live As Your Soul shows you how to become your own teacher, your own counsellor, your own healer and how to be this for your children. How to live As Your Soul also includes the unique, powerful healing of Trans Form. To pre-order your print or download version of How To Live As Your Soul please enter your details below. Each aspect of your body contains a gift that you are given for your journeying here. By remembering the gifts of your body you can know how to hear it and thus bring your body into its natural state of unification with the cosmos. This is the book that shows you how to master the energy power of your body, by bringing your body into it's most powerful resonance, that of the 12 Expressions of your soul and thus the profound healing of your soul's 12 relationships, to become the new human consciousness, the multidimensional being of your soul. You are taken step by step through the creation of your soul into human form, and how to make the healing and creation power of this energy, of your energy, an active presence in your mind, your body, your relationships and your life. Every part of your physical body is brought into being through the energy of one of the 12 Expressions. These Expressions show us the nature of our physical body's aspects, its organs and so on. They tell you what your body is made from and therefore the 'language' that your body speaks. By understanding the nature of your body's Expressions, you are able to directly connect with the nature of the energy that has created your body, and so become, in effect, the co-creator of your body, your mind, your life. Following the path that your soul has already mapped out becomes easier to navigate as you cease to struggle against the will of your cosmological energy creation, and so receive the power, knowledge and clarity that you already carry within you to assist you in fulfilling your purpose(s). Surrendering your will becomes easier and easier as your body begins to encompass and receive the energy memory of all the dimensions in which you are present - as in the old adage, once you've let go of the bone (of your will) it becomes increasingly pointless to continue to bark for it, and you're now free to scamper off and have fun! Your will becomes Thy will. This is the ultimate in being of service, the underlying theme of all our purposes. You become your true power, that of co-creator, you and the cosmos co-creating. The compassion that is courage becomes your guiding light as you seek to serve your purpose first, and then willingly receive whatever this brings to you with grace and underStanding. As you continue to follow your soul's lead, so you become the leader of your life. As you free your Self of your will so you become truly free. Breaking free from the bonds of the delusion that your power is rooted in the outward expression of your will, brings you back into the full glory of your power and love, which is, indeed, the power and love of the cosmos. 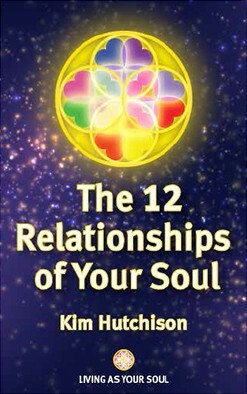 To pre-order your print or download version of The 12 Relationships of Your Soul please enter your details below.